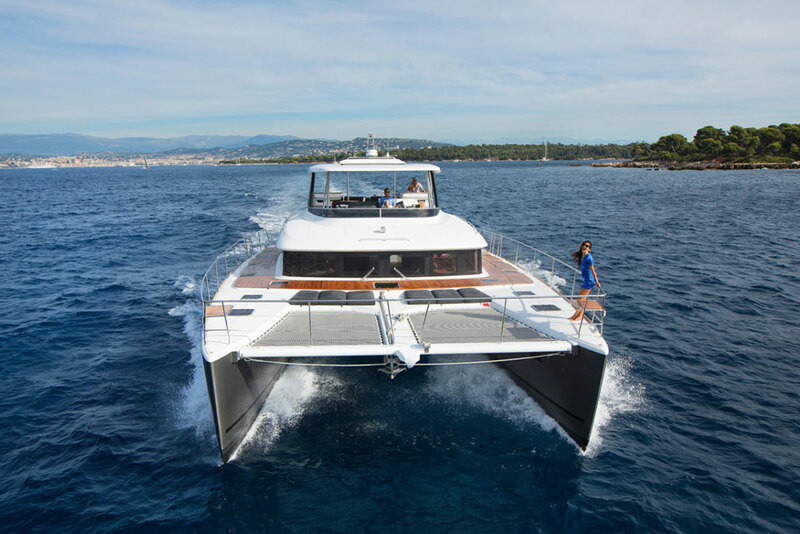 44 feet in length, and with a beam of 25 ft, the Lagoon 440 incorporates the very latest thinking in combining comfort with cruising performance to create a fast yet spacious boat. 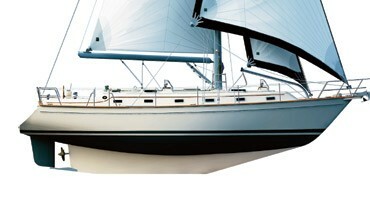 The most striking feature is the rigid bimini with its integral flying bridge steering position. 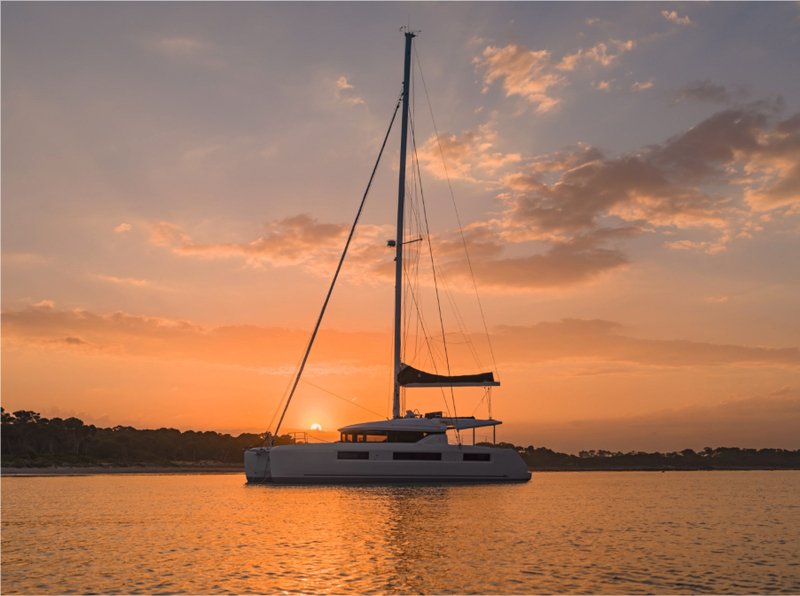 This not only gives the helmsman a superb 360° view, but with all sail controls leading back to the single, extra-wide seating position it makes short handed sailing both safe and convenient. 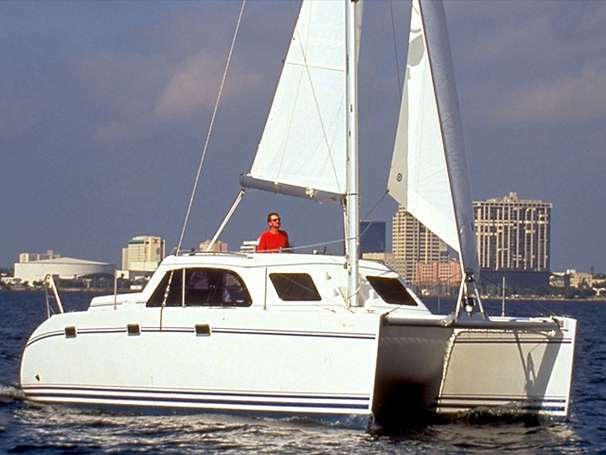 By removing the helm from the aft cockpit the raised bridge also dramatically improves the amount of space available to move around the boat. 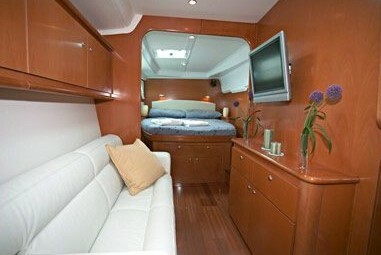 The aft cockpit easily accommodates up to ten guests while a transom crosswalk provides a convenient passageway between the sterns without the need to pass through the cockpit. Towards the bow the forward cockpit remains the ideal position to catch the breeze while under way and the top of the windlass locker forms a convenient table. 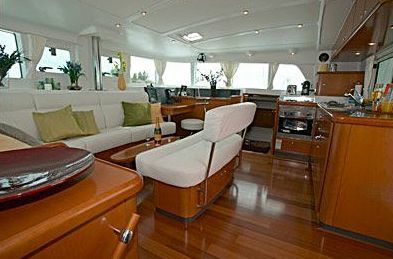 Inside, the saloon offers all-round views through Lagoon's trademark vertical windows, as well as luxurious seating, a galley area and a forward facing chart table. 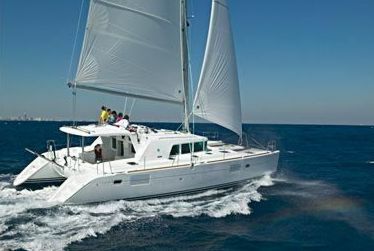 Below, the Lagoon 440 can be configured as a four, double-cabin with en-suite washroom charter version, or in a three, double cabin with en-suite washroom owners' format with the starboard hull fitted out as an oversized cabin with a generous washroom, side and front access to the berth and ample locker space. 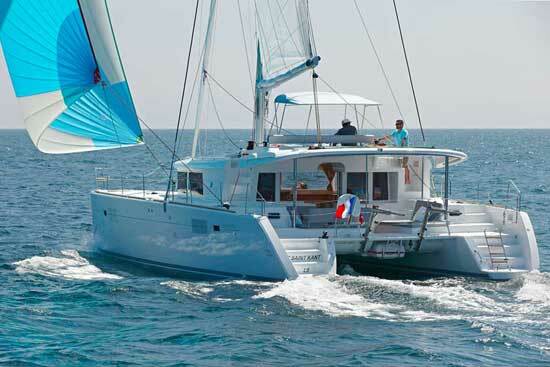 The Lagoon 440 is ideal both for charter work and long distance cruising. Safe, fast and easily handled in all conditions by a small crew, she combines traditional standards of workmanship with the very latest in ergonomic design and materials. Prices start at £340,000 plus VAT for a typical specification. 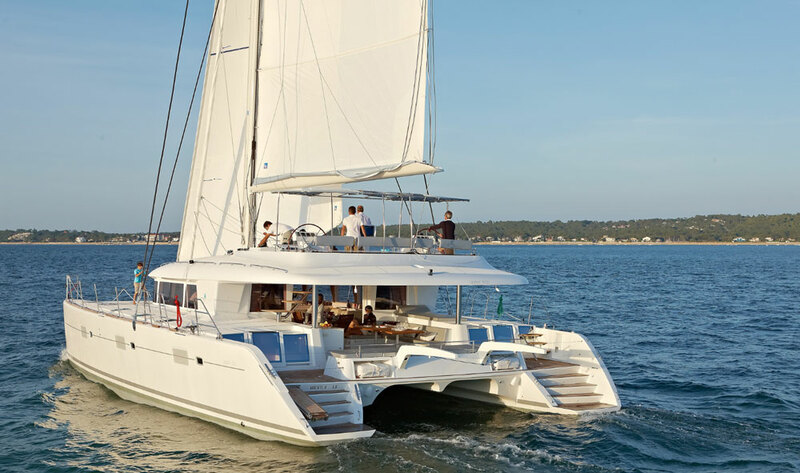 Built by the Custom Yacht Division of the Beneteau Group at Bordeaux, France, the Lagoon range of catamarans has been leading the way in luxury catamaran design for twenty years. 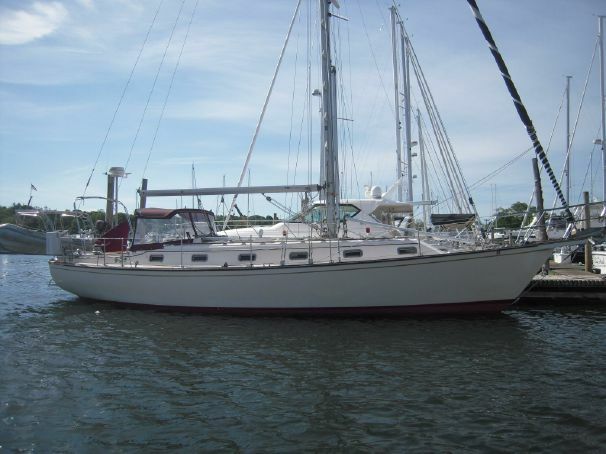 There are currently seven models available, ranging from 38 feet up to 67 feet. 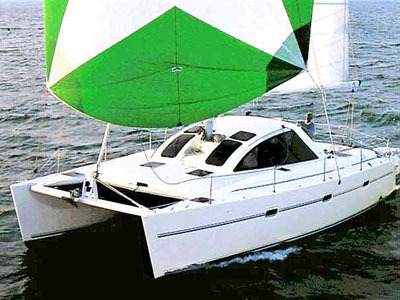 Ancasta International Boat Sales is the sole distributor within the United Kingdom.